The Kulpakji temple is located in the Nalgonda district of the state of Telangana in India. Found in the village called Kolanupaka, this is a famous Jain pilgrimage center with the temple dating back to the 10th century. This is situated 80 kilometers from the city of Hyderabad. The image in this temple, of Lord Rishabhanatha, is world renowned and called ‘Manikyaswami’, being made out of a precious green stone. There are three idols in the temple, that of Lord Rishabhanatha, Lord Mahavira, and Lord Neminatha. The origin of the temple is attributed to the ruler Bharat Chakravarthi. Ancient Jain texts have accounts stating that the Manikyaswami idol was worshipped by none other than the king Ravana’s wife, Mandodari. It was said to be brought and installed to this village by Kalyana’s ruler called Sankar. There are temple inscriptions dating back to the 12th century, which make it a site of historical significance as well. Being a flourishing Jain village in those times, the temple is now gaining back its former glory. This temple, dedicated to the very first Thirthanakara, also called Lord Adinatha, is believed to have originated after the idol chose this town to be its resting abode. The temple also houses the idols of eight of the other Thirthankaras. The main statue is more than 50 inches in height and is made of the precious stone of jade, which is called the ‘manikyakallu’ in the local language. This is a famous pilgrimage site for the Svetambara Jains who are from South India. 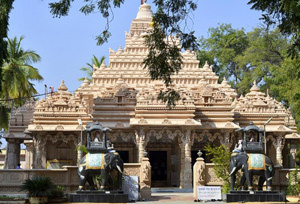 The temple had undergone a recent renovation which was a major one, undertaken by artisans numbering more than 150, coming from the states of Gujarat and Rajasthan. Though the inner sanctorum was preserved as it is, the surrounding was designed with a new temple. This was done by the Sompuras.